The TextTransformer is a development environment for the remodelling of texts: multiple replacements of words, evaluation of extracted data, text conversions and much more. Transformations can be tested step-by-step and applied to individual texts interactively or to specified groups of files. By the professional version projects can be exported as c++ code. END USERS can use the TextTransformer as stand-alone application for rapid manipulations of texts and PROFESSIONAL DEVELOPERS can use it as a so-called parser generator to produce c++ code too. Unlike other parser generators, the TextTransformer is not restricted on parsing formal languages: the TextTransformer can handle every kind of text, because it simply can skip unspecified sections of text. Multiple replacements of words: Unlike common tools for searching and replacing words, the TextTransformer can process an arbitrary number of expressions at once and expressions even can be exchanged mutually. The replacement can be restricted to special parts of text or to other conditions. Extraction of informations: Informations can be picked up from specialized positions in text files. For example data from all pages of a web site could be looked up. Validation of data (syntax check): Texts can be checked for syntactical correctness. For example in RTF files, there must be the same number of opening and closing curly brackets. This can be approved easily by a TextTransformer project. Conversion of different file formats: There are innumerable file formats produced by special software tools for insurance companies, financial enterprises or other enterprises there aren't any conversions for. Here the TextTransformer can help. Instrumentation of source code: Profiling or debugging code can be inserted automatically in other programming code. Development of script languages: For example the TextTransformer contains a subset of the c++ instructions as a script language, which was produced with itself. To prevent misunderstandings: the TextTransformer is not a collection of text processing tools, but a workbench to create your individual tool easily. Prefabricated tools only can cope with standard tasks. By the TextTransformer you can cope with any task. The creation of a TextTransformer project often only will take minutes. There are several wizards, by which frequently appearing tasks can be done nearly automatically. For your special needs, it often suffices to modify such a project. But if you want to process a complicated programming language, you will need some time for your project. Nevertheless, the time you'll need will be much less than with any other tool. This is because the rules for the creation are simple and each part of the project can be tested directly. Mainly there are only four structures by which a text will be analyzed: sequences, alternatives, options and repeats. These structures are the constituents of the so-called regular expressions. The TextTransformer can nest such regular expression to a description of the whole text. While the resulting project might be quite complex, the creation of the project remains easily comprehensible, as you can test each part independently from the others. At first there is a dialog, where single regular expressions can be tested. (Frequently used expression, like numbers, words etc. are predefined.) The combinations of these expressions than can be tested in the debugger: you can input a typical text, which shall be recognized, in the source window of the TextTransformer and than you can apply your project at once or step-by-step. If you then might find, that you have forgotten a row of the input, you can add the row in your specification and test again. At each step, a part of text will be consumed in the input. This part is shown in the input window and you can access it in your program. There you can decide, whether to write the part of text into the output, leave it, write it later or process it otherwise. The processing of the recognized parts of text is done by instructions, which are borrowed from the programming language c++. C++ has the reputation of being difficult. But one reason for this reputation is, that c++ normally has to be compiled to binary code first before it can be executed. In the TextTransformer, the instruction can be executed like a script language directly: the TextTransformer uses a c++ interpreter. Secondly for most purposes of the TextTransformer only a very simple subset of c++ is needed. Nevertheless, professional developers can include any c++ code, they want. The disadvantage of scripting languages is, that they don't have an error reporting system. The TextTransformer has one. If an error occurs, you will get an error message and by a double click on the message, the position, where the error occurred will be shown. By pressing F1, you will get an explanation of the error. The TextTransformer has an extensive context sensitive help, where the syntax of instructions can be seen or descriptions of the user interface can be found. The installation package of the TextTransformer contains a lot of examples, which are discussed in the tutorial in the help file. The tutorial begins with a simple word-exchanging project and ends with a complete java parser. Once you have a working project you can apply it on single texts inside of the TextTransformer working space interactively or you can apply it on specified groups of files in the integrated Transformation-Manager. You can process files by extra command line tool too. Professionals can export projects as ANSI/ISO c++ code. There you can get a 30-day trial of the standard version of the TextTransformer. When the 30 days have passed without registration of the program, it still can be used with the restricted capabilities of the free version. 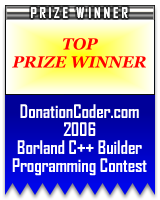 By The standard version you cannot produce external c++ code from your projects. This is the only difference to the professional version.